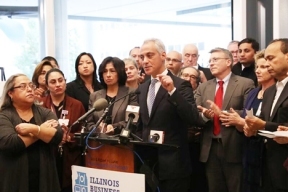 Congressman Luis Gutierrez, Mayor Rahm Emanuel, Illinois Dream Fund Chair Tanya Cabrera, among others stood alongside leading advocates to assure the youth and immigrant community proper resources will be available following the election. 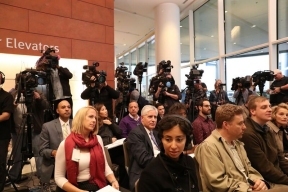 On Monday, Nov. 14th, city officials held a press conference at Ann & Robert H. Lurie Children’s Hospital of Chicago to discuss measures in place to help those suffering anxiety or distress after the increase in calls to community counseling centers, colleges, and mental health hotlines. During the press conference, advocates declared a significant spike in calls among undocumented students, refugees, immigrants, and the LGBTQ community. 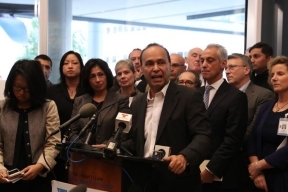 In response to the concern, Congressman Gutierrez and Mayor Emanuel stated that local government, healthcare leaders, and advocates will expand their services to address the ‘wellbeing and safety of all residents.’ In addition, both encouraged the community to contact and check-in on their undocumented-friends, neighbors, and colleagues. The City of Chicago in conjunction with other partners across the state reminded all residents that health and counseling and legal services are available. Also in attendance at the press conference were Illinois Department of Public Health Dr. Nirav Shah, Illinois Institute of Technology Student Egle Malinauskaite and Luis Gomez, Harold Washington Student Nancy Villa Avila, Colleen Cicchetti, Phd, Executive Director of Lurie Children’s Center for Childhood Resilience, Illinois Business Immigration Coalition co-chairs Carole Segal and John Atkinson. If you would like to receive additional information, call the City’s 311 system.